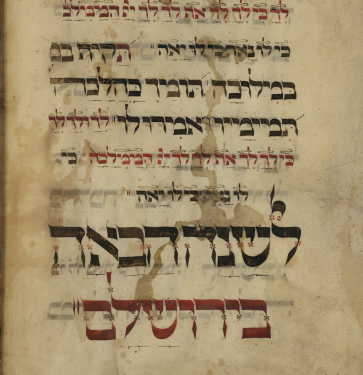 For over two hundred years since the Sefer Meor Einayim was published in תקנ”ח – 1798, Rav Nuchem Chernobler’s Torah on Chanukah has been learnt and repeated at probably every Chasidish “Lecht Tzinden” (candle-lighting) and Farbrengen on Chanukah. 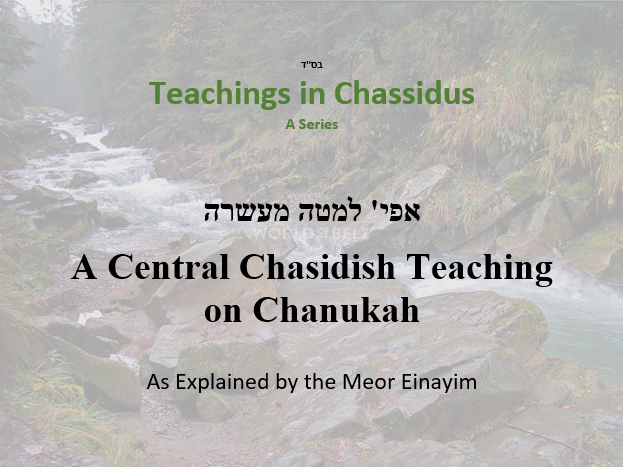 The Meor Einayim equates the lighting candles of Chanukah with the lighting candles of Shabbos. Shabbos and Chanukah, he explains, are times that a person becomes closer to Hashem. In these times Hashem reveals Himself more in the world and the Neshama is awakened and ready to come closer to Hashem. The candle-lighting reflects that. Candles have oil, a wick, and fire. 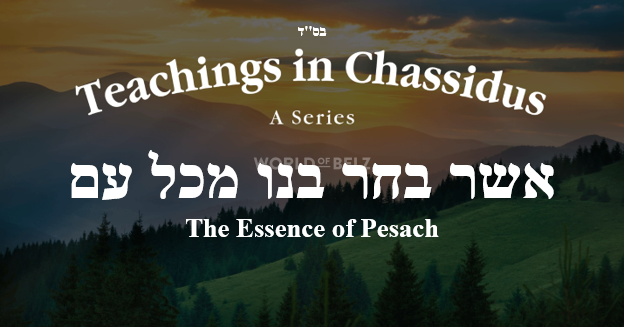 The wick represents the Neshama; the oil represents the Chachma – The wisdom of the Torah that teaches a person how to serve Hashem; and the fire represents our serving Hashem with a Chiyus and Ohr. On Shabbos and Chanukah, the Neshama is ignited to serve Hashem with a “Bren”. There’s a big difference though between Shabbos and Chanukah, continues the Meor Anayim. Chanukah, we put the Menorah lower than ten tefachim; Shabbos we don’t. This teaches that on Chanuka, more than Shabbos, Hashem reveals Himself to people who are on a much lower level. Furthermore, the Gemara says, מעולם לא ירדה שכינה למטה מעשרה – The Shechina doesn’t descend lower than ten tefachim. But the Chanukah Menorah is purposely put below ten, because on Chanukah the Shechina does descend lower than ten tefachim. 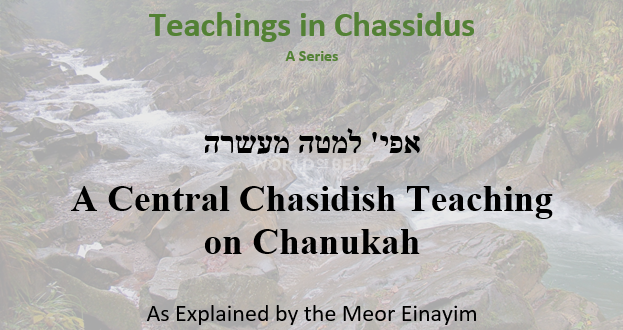 The reason why it’s so on Chanukah is because in order to bring back the Yidden in the times of the Misyavnim, Hashem descended and revealed Himself to people who are on very low levels. There is another difference between Shabbos and Chanukah in the types of wicks and oils that are permitted to use. The Gemara says that all the wicks and oils that are not permitted to be used for Shabbos candles, can be used for Chanukah candles. Says the Meor Anayim, the reason is because even those Neshamos whom Shabbos doesn’t touch and inspire them, Chanukah does. 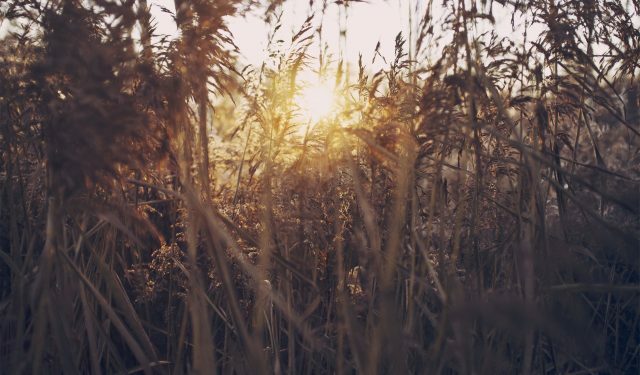 The story and Nissim of Chanukah are not only how the few miraculously won the many, it is also about the many Yidden who were very far from Hashem in that generation. Most Yidden were Misyavnim, who wanted to mix Greek Culture and Torah, and they returned fully to Hashem. Furthermore, the Story is not only about the Yidden who succumbed to Greek culture, it is also about the Yidden who hid and didn’t succumb. The Meor Einayim says, that these Yidden were serving Hashem with a dryness and without Chiyus. Their hiding reflected their inner Avoda. They were in a quandary and didn’t have the Da’as – consciousness to serve Hashem. Through the Mesiras Nefesh of the Chashmona’im and the Nissim that happened, there was a full revival of Yiddishkeit and of serving Hashem with the whole mind and heart. These Nissim repeat every year. Every year Hashem reveals Himself to the Neshamas who are far or uninspired, even to the ones that Shabbos doesn’t have an effect on them at all. Through Chanukah they can clasp to the Ohr and continue growing in Avodas Hashem and be alight and inspired every Shabbos and even every day.